to advance colon cancer research and awareness. Design for a Cure:™ was founded in July of 2009 by interior designer and colon cancer survivor, Lauren Schreyer. Diagnosed with colon cancer in June 2006, Lauren Schreyer became aware of the importance of early detection and quality treatment as it relates to the success of patient care. Lauren Schreyer became compelled to use her experience with art and design to advance cutting-edge research of this deadly disease that affects over 106,000 new patients in the U.S. every year. Through her efforts and community support, Design for a Cure:™ is now a non-profit organization using art and design to inspire a cure for colon cancer. Proceeds from Design for a Cure:™ will proudly support the Robert H. Lurie Comprehensive Cancer Center of Northwestern University. Design for a Cure:™ is awaiting 501(c)(3) status. Together we can help save lives of countless individuals – both in Chicago and worldwide. 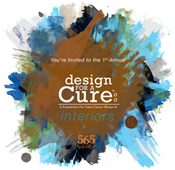 Our first annual event is Design for a Cure: Interiors. Our event will feature a Seasonal Showhouse at 565 Quincy in Chicago, IL. The Design for a Cure: Interiors showhouse will allow guests to view 4 condominium units designed for the 4 seasons. Our featured designers will be Room and Board, Design Studio/Roche Bobois, Mitchell Putlack Interiors, and Schreyer and Associates. Please check back soon to see our website! fan of Design for a Cure.